Gilbert Márkus presents Dr Angus Morrison with water freshly drawn from Tobar Mhaodháin, 17 Sept 2015. The Moderator of the Church of Scotland visited the Cowal peninsula and its churches two weeks ago. The Right Rev. 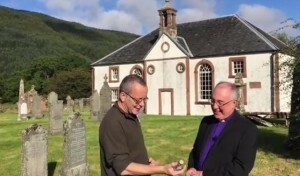 Dr Angus Morrison spent some time in Portavadie and Kilfinan, and before travelling to the kirks in Kilmun and Strone he stopped off at Kilmodan (Cill Mhaodháin). There he was met by the minister, and by Faith in Cowal worker Gilbert Márkus. Gilbert had been up the hill with a wee bottle at sunrise that morning to collect some water from the recently rediscovered St Modan’s Well (Tobar Mhaodháin). On a beautiful morning, the mist clearing from the bottom of Glendaruel, he welcomed the Moderator and presented him with the bottle. See the little celebration here.